More often than not, we are able to open clogged pipelines and clogged drains with our electric cable machines. This method of drain cleaning is an economical solution for unclogging smaller pipelines, such as in bathrooms and floor drains, amongst many other uses. Additionally, our experienced staff can determine the nature of pipeline damage or problems with the use of a cable machine. We can also perform limited root cutting services on pipelines ranging from 1"-6" in diameter with any of our three sizes of cable machines. For services where water is a limited resource and cannot be used with our hydraulic-powered root cutters we have a trailer-mounted power rodder which we can use. 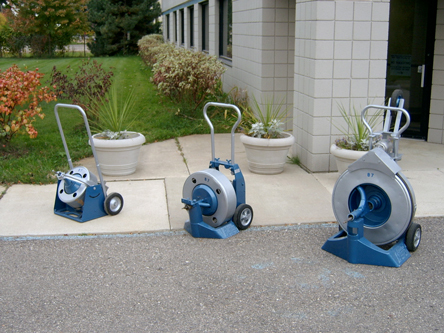 The power rodder is also an efficient tool in removing roots from larger diameter pipes. If you would like to have a site-specific evaluation performed, contact us by email on our Contact Us page, or by phone at (248) 960-1111. © 2011, Metro Environmental Services, Inc. All rights reserved.